Wonderful treasure to add to your dollhouse! Great set of dished for your dollhouse. All 1" scale. This cute little 1/12th scale kitchen canister can hold your dollhouse coffee or sugar or what have you, on your kitchen counter. The lid is removeable. The canister is 5/8ths inches tall, by 0.5 inches wide. This is a set of mixed pieces of miniature tea sets. They are porcelain and have various designs. The cups range from about 3/4 inch to a little over an inch. The tray is about 4 x 2 3/4 inches and the plates are between 1 and 2 1/4 inches. The pieces are free of cracks and are in good condition. Please see the pictures for more details. Set of 4 Pitchers. A tiny bit of age to the gold. Wonderful treasure to add to your dollhouse! How great to dsipaly in your dollhouse. All 1" scale. Features sweet Kewpie eating an ice cream sundae. Fantastic set! MINT condition in factory sealed box. MINIATURE PORCELAIN TEA SET. MINT IN BOX/FACTORY SEALED. Dollhouse miniature 17 piece porcelain tea set. White with a pink and purple floral design. 1:12 Scale. This is sized for a dollhouse. You are bidding on miniature handmade Thai porcelain tea set. It’s a replica of Thai Benjarong porcelain. Reutter Porzellan of Germany has an established reputation for creating high quality elegant dollhouse miniatures, well-crafted and beautiful to behold. in Gold Crosshatch Pattern. miniature soup bowls. Reutter Porzellan of Germany has an established reputation for creating high quality elegant dollhouse miniatures, well-crafted and beautiful to behold. see otherReutter Porcelain dollhouse miniatures. You are bidding on miniature handmade Thai porcelain tea pot. It’s a replica of Thai Benjarong porcelain. Reutter Porcelain Dollhouse Miniature Umbrella Girl Tea Set - 10 pcs. Reutter Porcelain Dollhouse Miniature Umbrella Girl Skillfully Hand-painted Fine Porcelain Tea Set - 10 pcs. 1 milk jar. 1 sugar jar. 2 tea Plates. They have never been in any collections they are straight from one family. See photos for the condition of this item. Safe and secure shipping to your home. Dollhouse Miniature Tea Set, Blue and Pink flowers porcelain, 7pc Ships Free! Great for pretend play with dolls or to display in a dollhouse. We are happy to answer them! Really pretty set! Make sure to look over the pictures, If you require other pictures of an item, feel free to ask. White set, with dark pink flowers, gold trim (6 pieces) White set, with blue Oriental design, gold trim (7 pieces) 7/8" H x 1-5/8" W, incl. White Sugar Bowl with Blue Flowers (1 piece). BARBIE Miniature Tea Set 8 Piece TeaPot Cups Plates Creamer MATEL Inc.
1 TEAPOT (NO LID). THE TEAPOT IS MISSING THE LID. THE REST OF THE PIECES ARE IN GOOD CONDITION. 8 PIECETEA SET. 1 CUP HAS A CHIP ON THE RIM (see last photo). NO ORIGINAL BOX. YOU'LL BE GLAD YOU DID! 11 piece tea mini tea set made in occupied Japan. Color is off white with a red flower. 1:12 Scale. This is sized for a dollhouse. Reutter Porzellan of Germany has an established reputation for creating high quality elegant dollhouse miniatures,well-crafted and beautiful to behold. 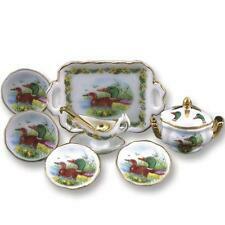 Reutter Porzellan has been creating miniature porcelain for over 50 years. PERFECT FOR A COLLECTOR OR A PRESENT. Dollys Gallery. 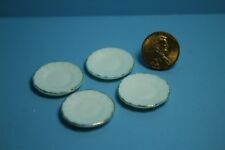 Dollhouse Miniature Serving Plate Tableware. White Porcelain Serving Plate. This is another fun item in the Blue Onion pattern by Reutter Porcelain. It is what I would guess to be the equivalent to a 3-quart saucepan with a lid. I think the Reutter pot lids are beautiful, with so much detail. This one is rimmed in gold. Also included is a rubber spatula and a plastic ear of corn still in the husk. This comes from my own personal collection and has never been displayed. Please feel free to ask questions. I do combine shipping. Assorted ceramic miniature tea set pieces. Dollhouse miniature 17 piece porcelain tea set. White with a cherry design. 1:12 Scale. This is sized for a dollhouse.